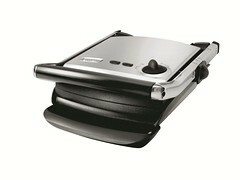 The Breville® TG400XL Gourmet Health Grill™ – With a floating hinge that adjusts to the thickness of food to an adjustable toast height control for delicate foods and open melts, even adjustable legs that allow for sloped or flat cooking; this versatile grill can cook anything you like, any way you like. A. Stainless Steel Housing. B. 1500W Heating Element. C. Non-Stick Scratch-Resistant Surface. D. Removable Drip Tray. G. Non-Stick Ribbed Bottom Cooking Plate. 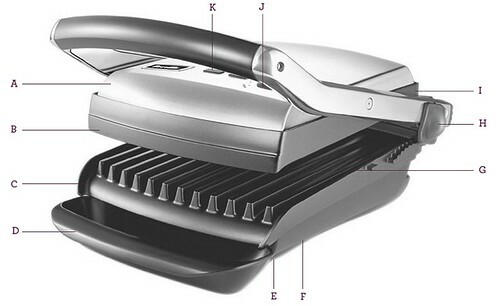 H. Adjustable Grilling Height Control. I. Non-Stick Ribbed Top Cooking Plate. J. Floating Hinged Top Plate.